The handsome Mazda 6 comes powered by a pair of four- and six-cylinder engines and is sportier than its competition, both in appearance and in its handling and driving dynamics. 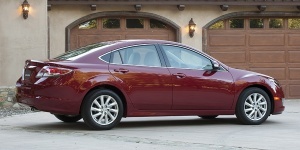 The Mazda6 receives only minor changes for 2013. Most notable is the demise of the 3s Touring Plus trim from the lineup, while Mazda 6i Touring Plus and Grand Touring upgrade to 18-in. alloy wheels. Find the used Mazda Mazda6 of your choice from a dealer in your area. Search our used car listings now.